SouthCoast Hyundai is very proud to team up with Simcoe Caring Cupboard to Drive out Hunger. 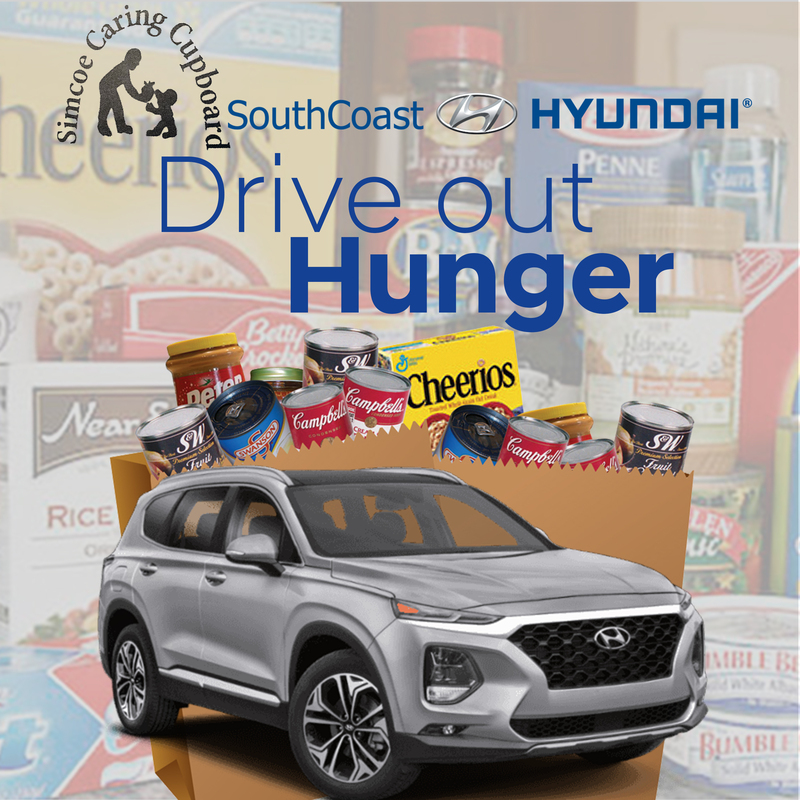 We are going to take the 2019 Hyundai Santa Fe in our showroom and fill it up with as much non-perishable items as we can. We are inviting everyone to come in to SouthCoast Hyundai, at 121 Queensway St E. in Simcoe, and donate non-perishable items so we can all help those in need have a better Easter season. The Simcoe Caring Cupboard is looking for the following items: peanut butter, canned pork, canned beans, canned beef stew/ meat type soups, canned tuna, canned flaked ham, canned chicken, canned turkey, canned vegitables, canned and dry soup, drink boxes, pudding cups, pasta sauce, mac & cheese, tea bags, canned evaporated milk, soda crackers, shampoo, conditioner, hand soap, Kleenex, toilet paper, men's and women's deodorant, laundry soap. SouthCoast Hyundai also wants to pitch in. So for every donation, we will match every item. As an added incentive to customers, if you bring in $15 worth of items, you will qualify for $250 off the purchase of a new vehicle. Ask our sales manager Marty Evans for more details.